In Wonder Boy in Monster Land after the defeat of the evil king, the kingdom of Wonder Land was a paradise... for a time. The peace was broken when a ferocious fire-breathing dragon struck without warning and took over Wonder Land with a swarm of evil, monstrous henchmen, turning the once-peaceful land into one of utter chaos; turning it into Monster Land! Unable to fight, the people looked to Wonder Boy. 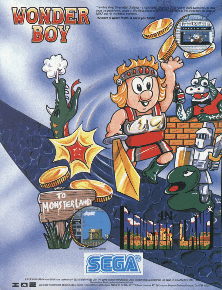 Realizing that he was Wonder Land's last hope, Wonder Boy set out on an incredible journey to rid the country of the monsters and to ultimately defeat the "invincible" evil dragon. Guide Wonder Boy through various environments and dungeons and defeat enemies, using special weapons and spells during the course of your journey! Audio can be heard but outputs a black screen. The graph below charts the compatibility with Wonder Boy in Monster Land since Dolphin's 2.0 release, listing revisions only where a compatibility change occurred. This page was last edited on 6 January 2018, at 12:04.